OK, Now in the last section we learned about the Default Black Bone and what it does and does not do. I have some good news for you. We really are not going to use it but you will need to keep its presence in mind for a little later (I will remind you when it is time to think about it). 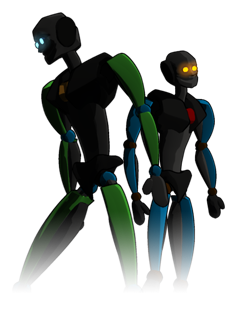 Now we are going to talk about the real bones in A:M.
Back to Bones Mode in our model file. Before we start assigning a model’s geometry to bones let’s get acquainted with just the bones first and how they work at the simplest level. Let’s go back to our blank model window. 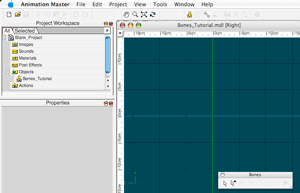 My view here is still in the [Right] view from before but I have deselected the default model bone . We’ve created our first bone here. Make sure that you are still in bones mode. Go ahead and switch your view back to the [Front] view. Now what we are going to do next is to add one bone so that we can learn a little more about it. The way that we do this is to click the “Add Mode” button in the Bones Toolbar or use the keyboard shortcut which is the “a” key. 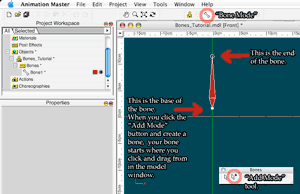 Then in the modeling window position the cursor where you want the base of the bone to begin then drag the mouse to the point where you want the bone to end. When you do this you will see the bone appear in the modeling window and increase in length until you let go. Go ahead and try this now. My first bone looks like what you can see in the picture on the left. 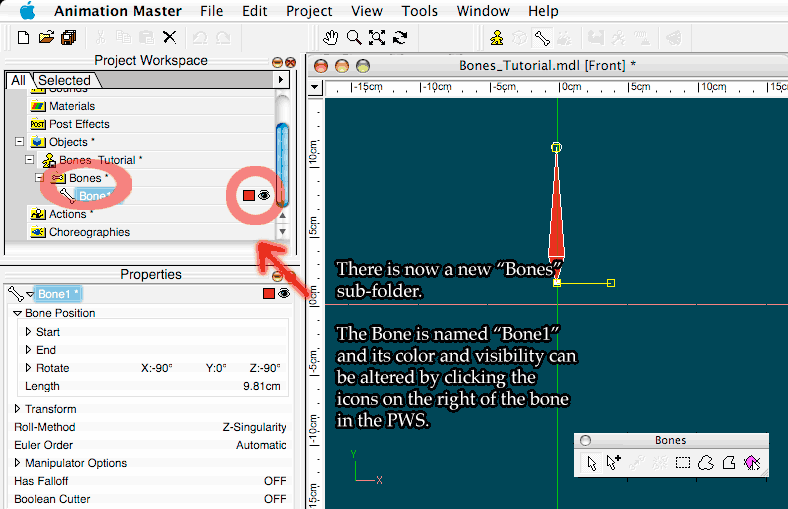 Check the Project Workspace (PWS) to see the “Bones” folder. 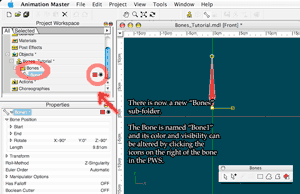 Notice that in the PWS there is now a new subfolder called “Bones” under the “Bones_Tutorial” model file in the “Objects” folder. This is a very important folder. This folder will contain all of the bones that you have added to this model file. Each model file that contains bones will have its own “Bones” folder that is separate from all other models. Since the bone in this illustration is still selected, the Properties window will show specific details about the selected bone. We can see that this bone was named “Bone1” automatically in the PWS. We can also see next to the bone name there is a red box and an eye icon. If we click the red box this will allow us to change the bone color to which ever color that we want by using a color picker. If we click the eye icon this will hide the bone from view in the model window. The eye icon will change to a closed eye icon. The bone will still be there since it has not be deleted it is only hidden until the closed eye icon is clicked again. Previous PostMechadelphia back onlineNext PostGrainy Shadows… No more!